Three photographs document a Soap Box Derby race in Akron, Ohio. Myron Scott, a Dayton Daily News photographer, established the All-American Soap Box Derby in Dayton in 1933. The first race was such a success that another was planned for the following year, with support of newspapers across the country. Akron Beacon Journal sports editor Jim Schlemmer was instrumental in garnering support from Akron's rubber companies for the race. Shortly after the 1934 race, a delegation from Akron met with Derby sponsor Chevrolet to explore the possibility of making the Derby a national event and moving it to Akron. 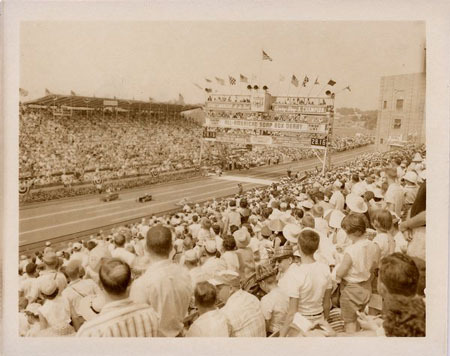 They were successful and in 1935 the Soap Box Derby was held in Akron on Tallmadge Hill. The following year the Derby was held at Derby Downs, a Works Progress Administration project built adjacent to the Akron Municipal Airport. Each summer the Derby attracts youth from all over the world to compete in the Gravity Grand Prix. The photographs measure 3" x 5" (7.62 x 12.7 cm). This file has no author information, and may be lacking other information.